Labor Day Book Set Special – Get a Free CD! September 3, 2011 by LindaJoy Rose . Posted in " News, Promotions " . Heal and balance Mind, Body & Spirit! Ebooklet – A Year of Positive Habits – The 21 Day Secret to Changing your Life Cutting edge techniques to create positive, life-affirming habits in as little as 21 days spending up to only 20 minutes a day! Meditative CD –A Gathering of Fairies 55 minute meditative music interwoven with Alpha and theta brain wave patterns to deepen relaxation and inspire creativity, making this disc ideal for meditation, stretching, space-clearing or stress busting. Sample these musical masterpieces here. 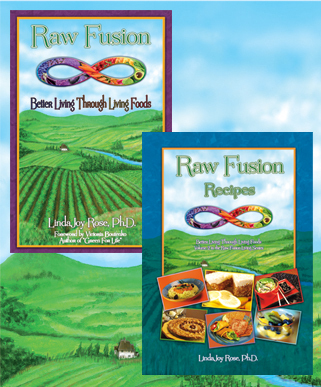 VOLUME ONE: Raw Fusion: Better Living through Living Foods guides you through the maze of modern-day food choices to make more informed decisions about how to best fuel your family’s vitality. Raw Fusion shows you everything you need to know to implement a nutritious eating program to boost your energy, please your palate, and tap your highest potential. 366 pages. 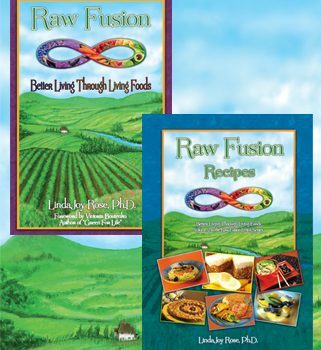 VOLUME TWO: Raw Fusion: Recipes teaches you hundreds of delicious ways to improve your health and well-being, from morning Green Smoothies, to luscious lunch salads to pizza for dinner and “Mounds of Joy” for dessert. More than just a diet, Raw Fusion is a self-empowering lifestyle for a healthier body and a clearer mind. 170 pages. The Premier Raw Fusion Recipe Book, Recipes combines delicious and nutritious raw ingredients with traditional mainstream meals. Lose weight naturally by eating right! Order through Tuesday, September 6th and we will automatically add the meditative music CD to all orders. In "Events, Health, Miscellaneous, Motivational, News, Nutrition, Weight Loss"
In "Health, News, Raw Fusion Solution, Research, Tips & Tricks"
I’am looking forward to the encouragement from your book.